Experience the white Atlantic surf, the fun of the enormous beach, the truly fresh air or have a relaxed dip in either the heated indoor or outdoor pools at Riviere Sands. Get ready, get your towels and swimming costumes ready and enjoy Carbis Bay, a beautiful, safe beach close to St Ives, and ideal for bathing windsurfing or waterskiing. Visit picturesque St.Ives and the beautiful and varied coves, visit Britain's most westerly point, Land's End with fantastic views of the Atlantic Ocean all around from the comfort and beauty of Riviere Sands. Looking out to sea from here allows the mind to appreciate the scale of the Atlantic Ocean, seeming to stretch beyond the horizon for ever. 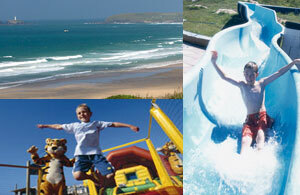 Enjoy an exhilarating blend of beach fun, safe bathing and fun-filled family facilities at Riviere Sands Holiday Park in Cornwall. This is one of Cornwall's biggest white sand, blue water bays close to St Ives.